Biquie, Isthmus of Tehuantepec, Oaxaca. Many people in the Isthmus of Tehuantepec hold fast to the Zapotec tradition of having a biquie (pronounced “beqei”) in place of the pyramidal altar. 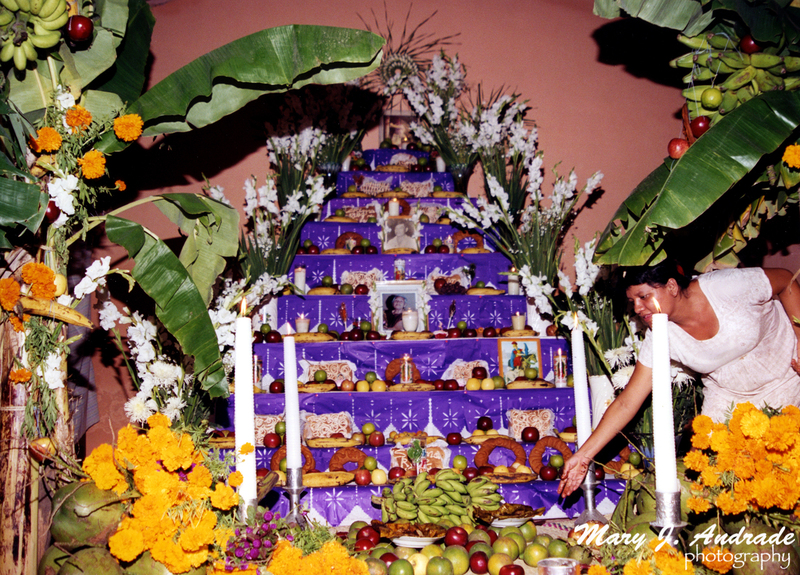 The biquie is the offering or cross made of flowers and fruit, which is decorated with pan de muerto. 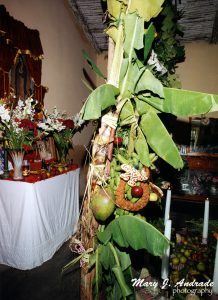 The traditional biquie, or cross, extends from floor up to the ceiling, since in some homes the branches of the entire banana plant may reach the titles of the roof (the homes don’t have ceilings), of the living room. 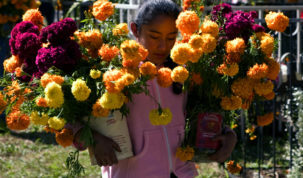 The decoration on the biquie can be exuberant in the arrangements of lowers, fruits, and candles displaying an altar rich in Zapotec tradition. The biquie extends covering practically the whole area of the living room. 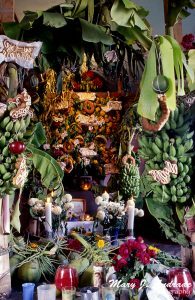 In front of the altar there is an arch made of two banana plants that almost creates a small room due to their size. 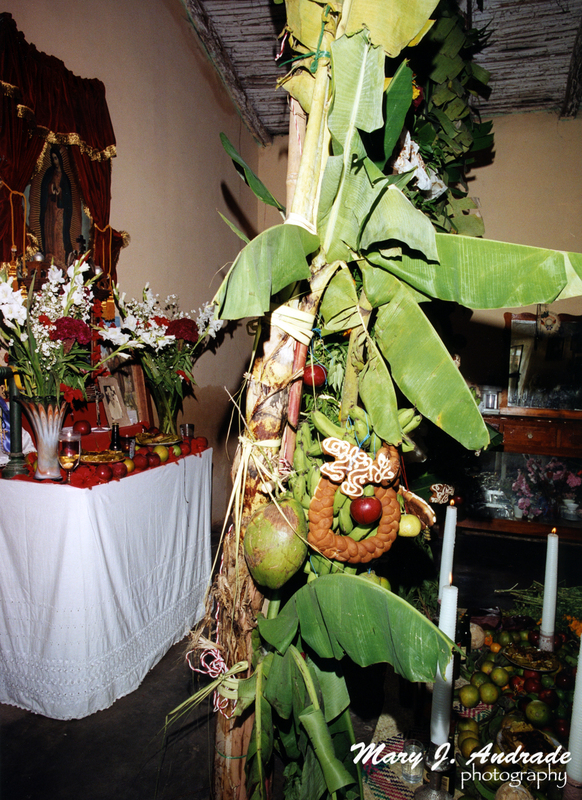 Different types of fruits decorate the cross and are intertwined with cempasuchitl flowers, wreath-shaped bread, and coconuts. The drapes used on the background of the pyramidal altars are black, purple, or white in color. In the biquie the background the wall is covered with plants, vegetables, fruits, and bread especially made for the occasion. Each family placed their order at the bakery, and the name of the deceased is inscribed on the bread. The Catholic altar behind the biquie. 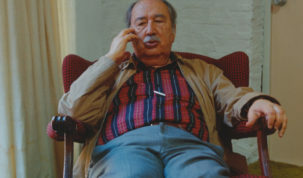 Tehuantepec, Oaxaca. Thus on the biquie’s green background of vegetation, brown pieces of bread in the shape of squares and rectangles stand out. White caramel is used to write the name of the deceased on each piece of bread. Between the arch and the “background wall,” a picture of the deceased is put in and placed at ground level, surrounded by candles, sodas, fruits, and tamales without husks for the soul to be nourished by its aroma. Behind the arch there is a table with a white tablecloth; on top of which is a variety of fruits and candles. Behind the biquie is the traditional altar of the house, with the images of the virgin an generally speaking, when a reference is made in regards to the religious syncretism in Mexico, it is the presumption that the gods of ancient times are still present behind the images of the saints. The opposite applies d favorites of the family saints, also decorated with fruits, flowers, bread, and candles. Generally speaking, when a reference is made in regards to the religious syncretism in Mexico, it is the presumption that the gods of ancient times are still present behind the images of the saints. The opposite applies in the case. 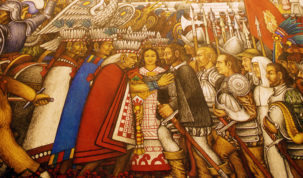 Behind the biquie, which represents the Zapotec culture, are the religious images of the Catholic cult.